Welcome to the International Monster Truck Museum & Hall of Fame Online Store! Here you can purchase items including Official Merchandise and tickets to the Annual IMTM Hall of Fame Induction Ceremony & Reunion. Click “Add to Cart” below the item you want to purchase, and view your cart which will appear at the top of the page. When ready, make sure your quantity is correct, click “Checkout” and your payment will be processed through Paypal! Show off your support of IMTM with these great looking stickers! All proceeds of these sales will help IMTM work to acquire and preserve monster truck history and support the Annual Hall of Fame Induction Ceremony & Reunion. 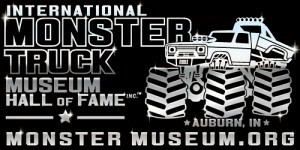 More Official Merchandise will be coming soon to the International Monster Truck Museum & Hall of Fame Online Store!